Satu Hati Central Waste Bank which is under West Jakarta Environment (LH) Sub-dept. supervision has managed to achieve turnover for Rp 4.1 billion within a year, from August 2017 to 2018 period.
" While from August 2017 to 2018 period, we manage to get around Rp 4.1 billion"
West Jakarta LH Sub-dept. Head, Edi Mulyanto said, Satu Hati Central Waste Bank accommodates around 820 tons non-organic waste from 775 waste bank units in eight sub-districts every day. "Satu Hati Central Waste Bank's income from January to August 2018 reaches Rp 2.6 billion. While from August 2017 to 2018 period, we manage to get around Rp 4.1 billion," he stated, Monday (9/10). He mentioned, there are also 336,000 residents who participate as members from total 775 waste banks in West Jakarta. They sort waste into two categories, non-organic and economic valued waste, then bring it to waste bank unit in their area. 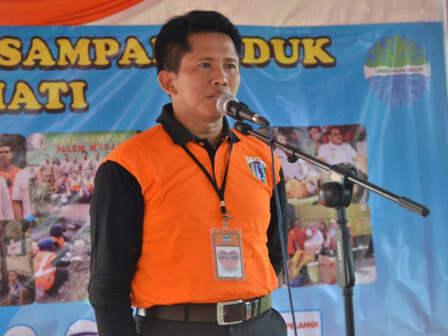 "We prepare 15 trucks to transport non-organic trash from 775 BSU in eight sub-districts and take it to Satu Hati BSI at Komplek Kebersihan DKI," he explained. He is optimistic there will be more BSU (waste bank unit) in West Jakarta in line with resident's awareness to sort non-organic and economic valued waste. "Later, we can reduce waste transporting to Bantargebang Landfill more optimally," he mentioned.